HomeWorld Chess ChampionshipCarlsen vs Caruana 20187 Day Warning — Carlsen vs Caruana Starts in One Week! 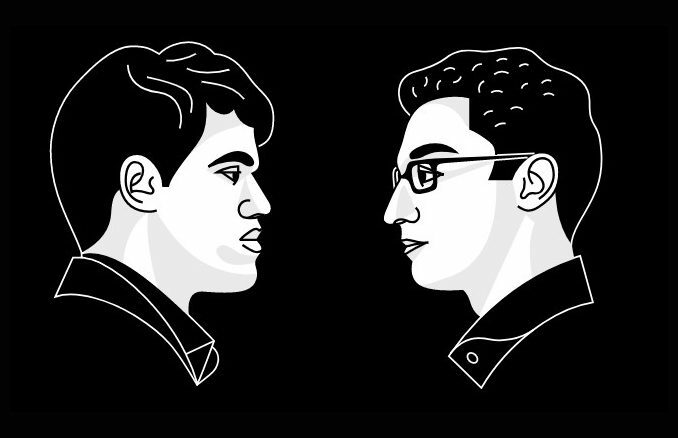 7 Day Warning — Carlsen vs Caruana Starts in One Week! World Chess Championship 2018 to take place in London, United Kingdom, between November 8th and 28th. World Champion, Magnus Carlsen of Norway, defends his title against Challenger, Fabiano Caruana of the United States of America, in a twelve game match. In a week’s time, the chess World will be gearing up for game one of the World Chess Championship 2018. 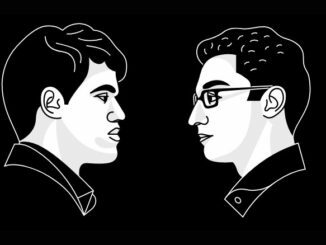 The match will be contested between reigning World Champion, Magnus Carlsen of Norway and his American Challenger, Fabiano Caruana. This match is one of the most keenly anticipated chess World Championships in recent years. 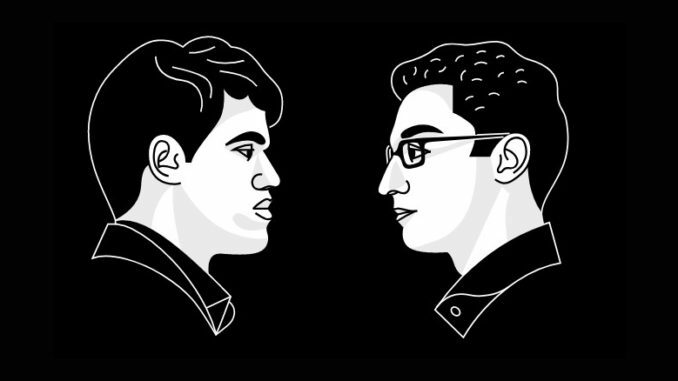 It features the two top chess players in the World right now. In fact, they are separated by just a few points — Carlsen on 2835 and Caruana 2832. The match will be held at The College in Holborn, London, United Kingdom. It is of course overseen by the world governing body of chess, FIDE (Fédération Internationale des Échecs) and its commercial partner Agon. Collectively, the two take the responsibility of managing the World Chess Championship under the banner of World Chess. Having been officially opened on Thursday November 8th, battle will commence with game one on Friday November 9th at 15:00 local time (check your time here.). This will be just the first of a possible twelve ‘classical’ games. The time control for the games is: 100 minutes for the first 40 moves; 50 minutes for the next 20 moves; then 15 minutes for the rest of the game. There will be increments of 30 seconds per move starting from move 1. The players are not allowed to agree a draw before move thirty. Technical draws (perpetual check, repetition, etc.) before that time will be deemed by the Chief Arbiter. As well as the World Title and world #1 spot, (the two are rather hand-in-hand this year), the winner also takes the majority of a prize pot of over one-million Euro, (878,983 pound sterling / 1,144,957 US Dollars). Rather predictably, World Chess intends to place certain restrictions upon the broadcasting of the event. Just days ago, they released what they call a ‘policy and user agreement’ governing the transmission of the moves. What this agreement says, in a nutshell, is that those transmitting the moves live … well, that will be just World Chess in their official tournament broadcast. Third party websites who want to broadcast the games, will be bound by a thirty-minute delay when it comes to the moves. They must also include a prominent notice, which points their viewers to the official premium broadcast. World Chess have also provided official widgets for websites to use. This is how things will be should World Chess get their way; but will they? The policy has been met with distaste by many chess fans and chess websites alike. There is also a touch of déjà vu about it. The same thing happened with the 2016 Championship, of course, with websites such as Chess24 defying the restrictions. This resulted in World Chess taking legal action. I will get into this matter more deeply in a later post. For now, we wait and see where it will all lead this time around. A positive point when it comes to the official broadcast, is that Judit Polgar is lined up for the commentary. However, what fills me with reservation, is that past official World Chess broadcasts, have suffered from technical issues. Any of that for this match would be extremely bad indeed, especially if that is the only way for chess fans to see it. I will be in London for the duration of the match. Below is a bit of an idea as to the kind of coverage I am planning. Preview: This has already begun with this post, which marks the one-week countdown to game one. Coming up on Monday November 5th, there will be a feature on the Defending Champion, Magnus Carlsen. This will be followed by a feature on his Challenger, Fabiano Caruana, on Wednesday November 7th. Daily blogs: I will be blogging at least once a day during the tournament, beginning with the opening ceremony. I will of course blog on each game, with analysis and behind-the-scenes information. Along with this, I will be posting supplementary blog pieces, especially on rest days, but also on game days if needed. I want to try to have you along and bring you as much of the experience as I can — so let me know if there is something in particular that you would like to know or see! Game Days (November): 1 – 9th; 2 – 10th, 3 – 12th, 4 – 13th, 5 – 15th, 6 – 16th, 7 – 18th, 8 – 19th, 9 – 21st, 10 – 22nd, 11 – 24th, 12 – 26th. Rest Days (November): 11th, 14th, 17th, 20th, 23rd, 25th, 27th (if tie-breaks). Tie-Breaks / Award Ceremony / Closing: November 28th. World Chess Championship 2018: Can Carlsen Make It Four? Norway Chess 2018: Round Eight: Caruana & Nakamura Win. Sinquefield Cup 2018, Round 8: Another Round of Draws, Caruana Leads By Half a Point Going To Last Round.